It all began with a clearing in the woods cluttered with ramshackle buildings from a former homestead: the remains of a cabin, a leaning barn, a decaying pig sty and chicken coop. I was horrified to learn this was to be the site for our camp. Why would we want a camp to begin with when we lived amidst a beautiful landscape waiting to be explored? “I’ll never come here,” I said to my husband. If he wanted a camp, so be it. I did not! Jon proceeded without me. One day he took me to the transformed site – the buildings were gone, the clearing pristine. Then he purchased a 100-year old log cabin which had brambles growing inside and no windows and doors. Again I was aghast. But Jon was undeterred. The building was taken apart, transferred and rebuilt. Trees were felled for replacement logs, windows cut, doors made, layers of wallpaper stripped off the cedar logs. Endless work, but I participated, helped lay the floor, chinked, found furniture, worked to make the place cozy. 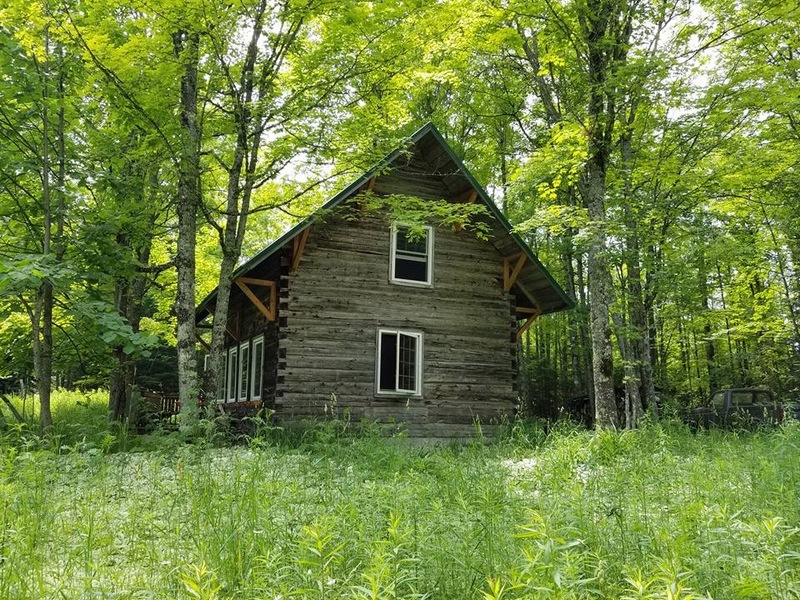 The two-story cabin has been proudly standing in our clearing since 1994, over time joined by a two-seater outhouse bought from an aunt, a shed and sauna rescued from a pasture for cows who rubbed the dovetailed corners round. Finnish relatives equipped the smoke sauna with a hearth and benches, and a deck was added to the house. Although I said I’d never come, I have grown to love our camp above the West Branch of the Whitefish River. Why? What does camp mean for me? With a thirty-mile trip, it is close enough from home to come for just an evening in the summer or for an overnight stay. Of course, if we can we stay longer, but whatever the length of our visit, we return to town refreshed. Thanks to the “primitive” nature of the place – no electricity, a spring in the woods, a wood stove, life there slows down immediately. We forget about the news, e-mail or phone connection. Instead we make sure the kerosene lamps are filled for the evening and that there is enough wood to stay warm. This is a place just to be. We cook simple meals, talk, write letters, read and play scrabble. We take time to take a nap, we go to bed early. In summer we take canoe rides on the river, in winter we ski. We watch the natural world around us: a wild turkey has lost a beautiful feather, irises are blooming on the shore, a heron flies overhead. Although we are close to a road, we seem far away from civilization. I can sunbathe unobserved. There are berries and mushrooms and flowers to pick. The stars shine brightly at night, the moon lights up the clearing, fireflies glow in the dark. Because the area is small, we have gotten to know it intimately. Every time we come we see changes. The river swells from melting snow, spring leaves unfold, white trilliums cover the dark forest floor. Here we are aware of the annual cycle of growth and decay and of our place in this universe. Aside from all that, at camp we are surrounded by our ancestors: the flour bin reminds us of Jon’s grandmother’s farm. Jon’s father brought the cuckoo clock from the war in Europe, and camp brings me back to my childhood, to the Austrian mountain farm without electricity and running water where I grew up. Here I am connected to the past and to nature. Here I feel whole. Christine Saari, an Austrian immigrant, is a writer and visual artist. She has published a book, Love and War at Stag Farm, The Story of Hirschengut, an Austrian Mountain Farm 1938-48. It tells the story of her family in Austria during WWII and its aftermath. Reprinted with permission from the Summer 2012 issue of Health & Happiness U.P. Magazine, copyright 2012. All rights reserved.